The edges on the banner are great. Really gives it some texture. 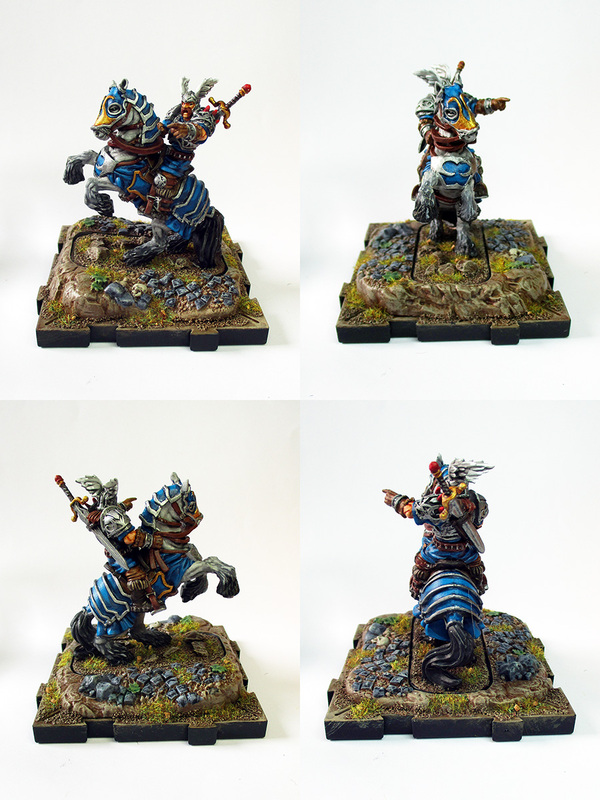 The wizard completes the Daqan infantry command. He's not going into uniform, so he's got a different color scheme. 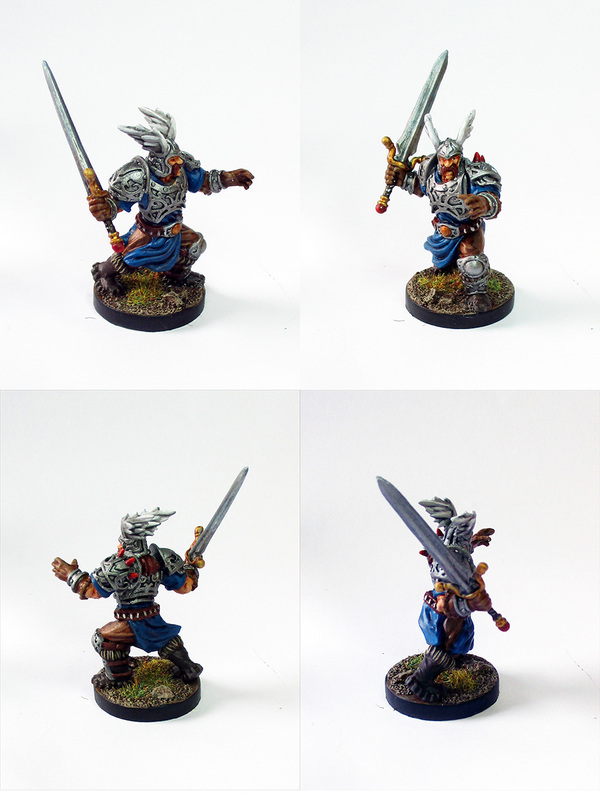 Phew, it's been a while - first I only painted more of the same (Oathsworn and reanimate archers), and the I didn't get around to do much painting for a couple weeks. But now I've managed to complete my Ankaur Maro. Evil surfer dude, surfing his wave of bone. 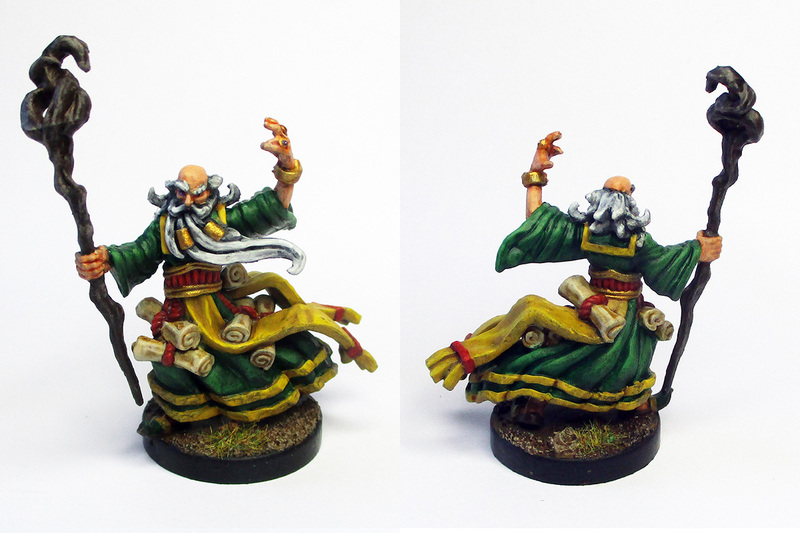 He just had to get a fuligin cloak and despite black being a pain to paint, I'm quite happy with the outcome. Get micro set/micro sol, you can use water transfer on the banner, check mine out. Nice work Uthoroc , you managed to mostly maintain the black (tricky business that). Very cool stuff! What did you use for terrain? Do you mean for my terrain pieces? Cardboard, bird sand, gravel and rocks from the street, tooth picks and cocktail sticks. 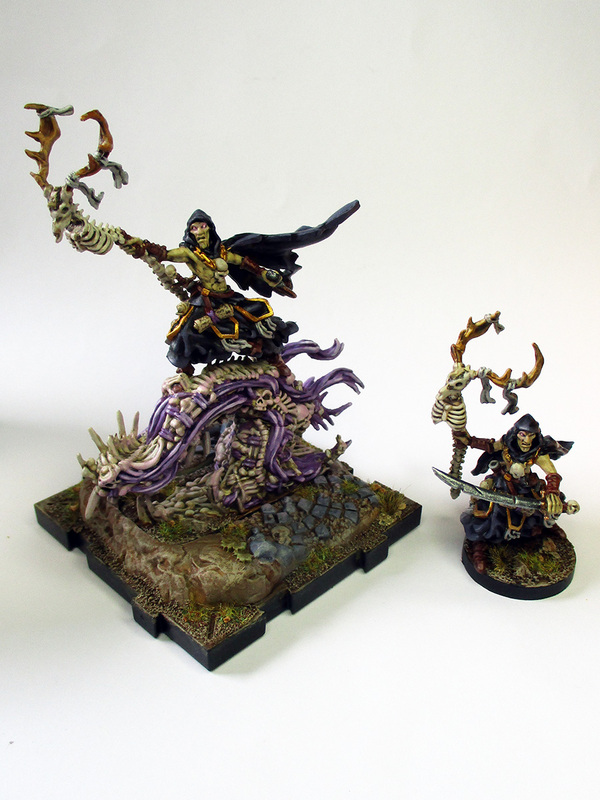 Ankaur has some grass flock on the base as well as a few tufts of Army Painter grass. Nice, it all looks great! I've been thinking about creating terrain, but I've never done it before. It was my first terrain as well, and it was much easier than expected. 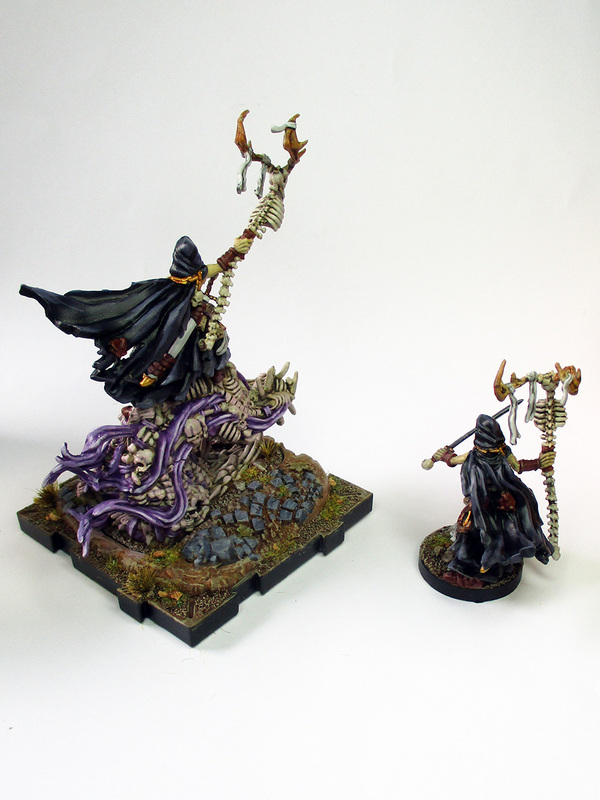 Check out the Terrain Tutor's YouTube channel for his beginner videos. Extremely useful. 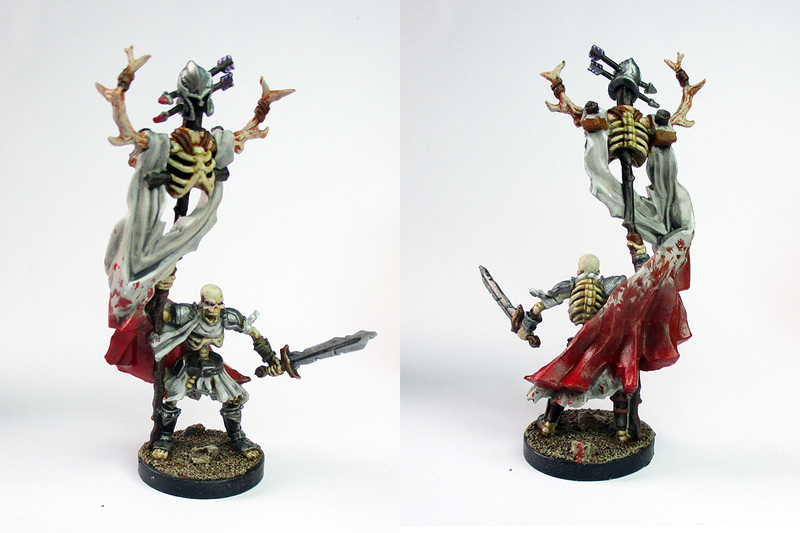 A second carrion lancer is ready for the battle field! Looking great. I like the reflective light on the bone. Well done. Next up before my golem and carrion lancer reinforcements arrive: Lord Hawthorne. Another rune rune golem - from my second starter box. I'm still waiting for the expansion golems and carrion lancers to arrive at my local game store. This guy is brandishing a rock in addition to his two swords. I literally have made gat repose, and added a rock in the top hand. Hah. 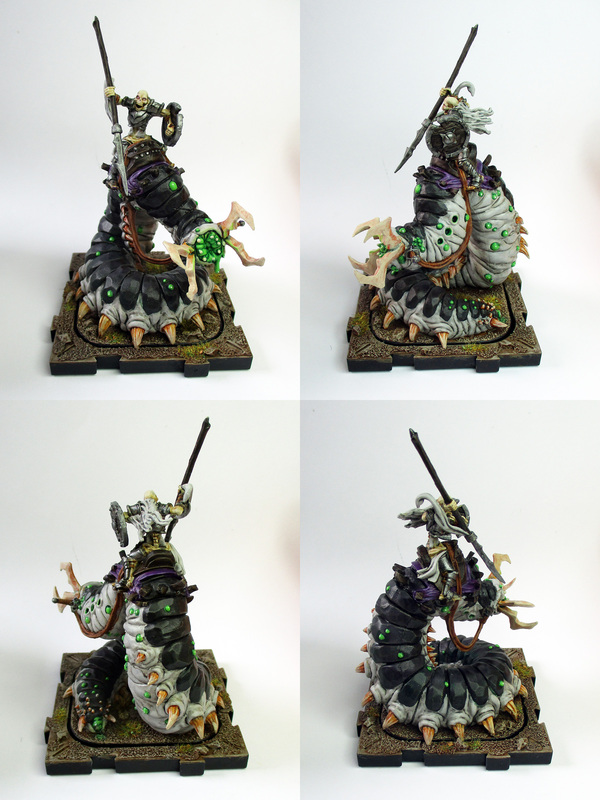 You've made me re consider the mini, i was not very impressed with other pics, but yours looks amazing. thanks for sharing! Glad I did! I was very doubtful about the mini myself at the beginning, and his proportions still feel a bit weird. On the other hand, once you accept the comic-style he's a pretty cool mini with a lot of character. Now I'm delving further into the second starter box with a little conversion work on my second Ardus. 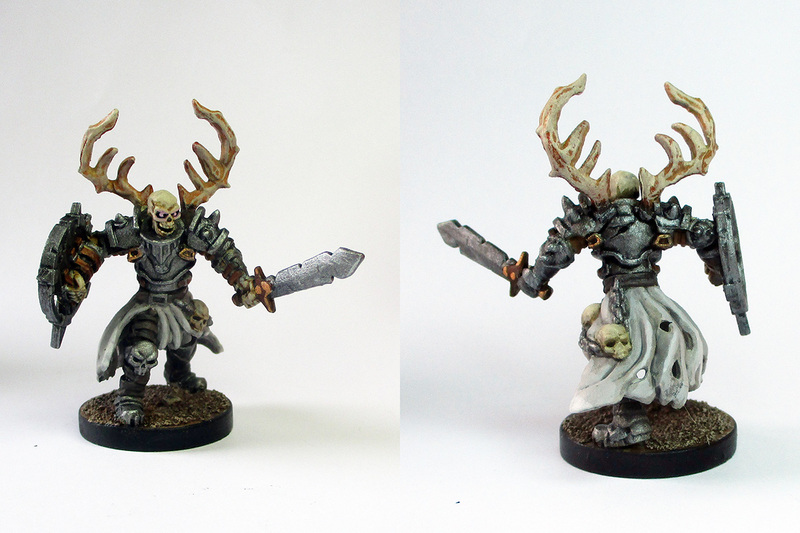 I moved his antlers from the helmet to his back (similar to the champion from the command box) and swapped his left axe hand with a shield arm from the normal reanimates. I quite like how it came out. He now makes a great second champion figure. What are you using to make the pupils on the reanimates? A super fine brush and a steady hand I bet. You have professional level lighting & photos too. Thanks for sharing. You don't need small brushes for details like that, esp sculpted details like the waiqur pupils. Any decent #1 or #2 brush will keep a good enough point to do it easily. Most of the eyes have been done with my size 0 brush (which is my go to brush for most detail work), but I did put a tiny white dot in the center with a 00 to make them pop. Skinny, pale, no shirt, large gold chain. It's Eastern European Mobster Maro! I love it. I really like the choice of silver instead of Gold on the Daqan. Makes them look less cartoonish compared to the official colors. 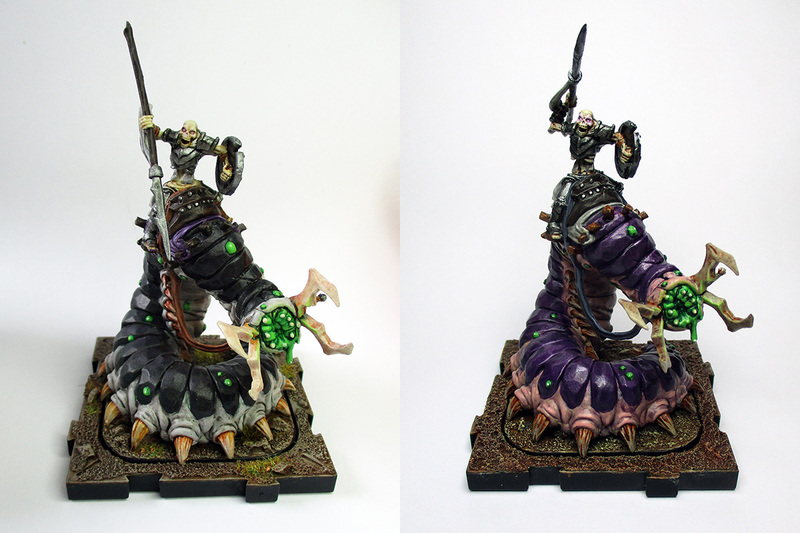 Rune Golem and Carrion Lancer goodness. I'm amazed at myself that I'm still going strong *fingers crossed*. that sandstone golem is amazing. Tis one of the stones i want to make mine. 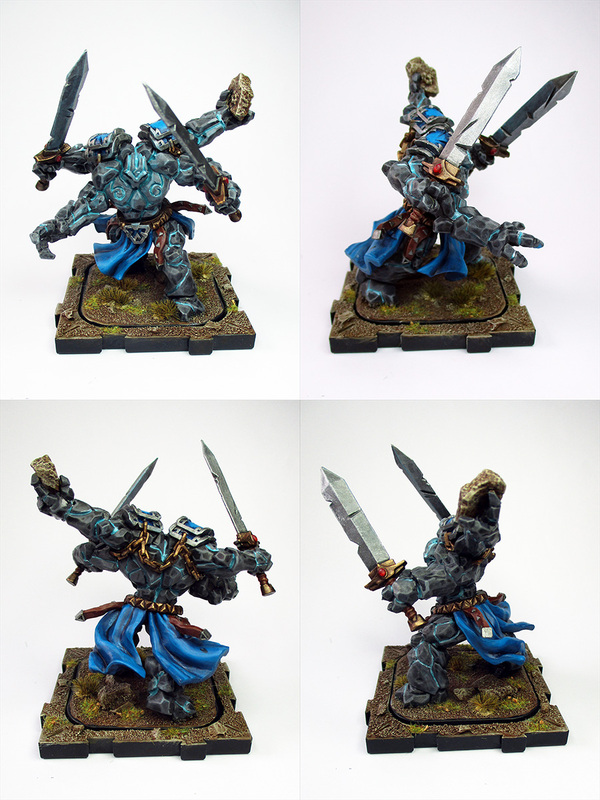 The clay color really works great with the blue glow on the golem. Please tell me you call him Mr. Pump. More Waiqar leadership, including the feared Blood-drenched Banner!